This design embraces openness, showcasing a willingness to share its inner most contents through the medium of open shelves, while at the same time having the ability to harbour a secret indulgence in a Narnia concealing corner larder! 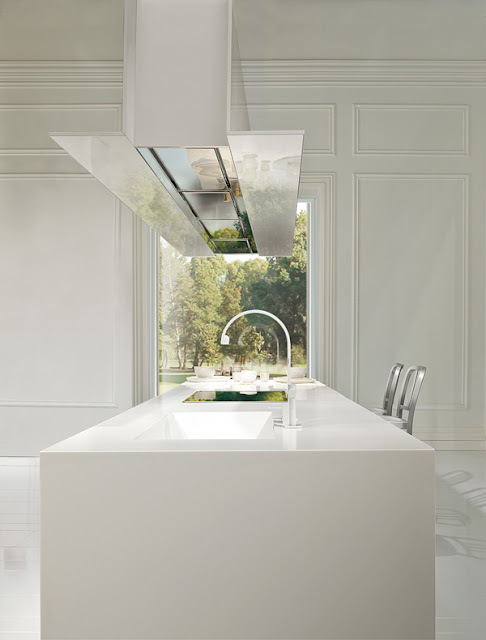 The island stands out as an artistic indulgence with the circular drum acting as a contrasting counter weight to the entire design and providing an interesting platform for culinary and social exchange. The Mogul loves this design and can see influences from several quarters. One being more dominant than the rest!! The client! Sometimes it can be hard to find balance, difficult to create perfection and virtually impossible to find the perfect combination of elements that will appease the tribal issues created by form and function. Upon looking at this design it becomes evident that functionality has become surpassed by the need for visual stimulation. 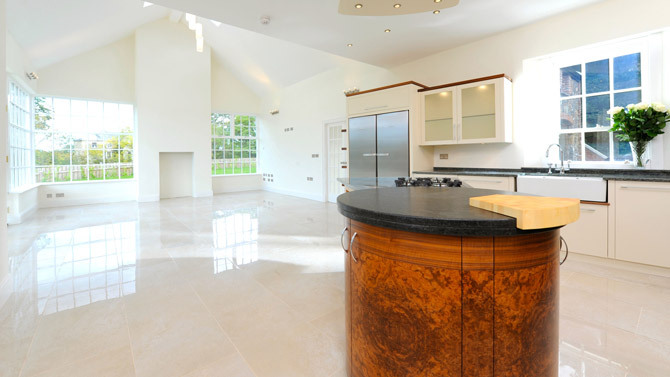 The worktop is allowed to envelop the cabinetry forming both a waterfall edge and a mirror image plinth. 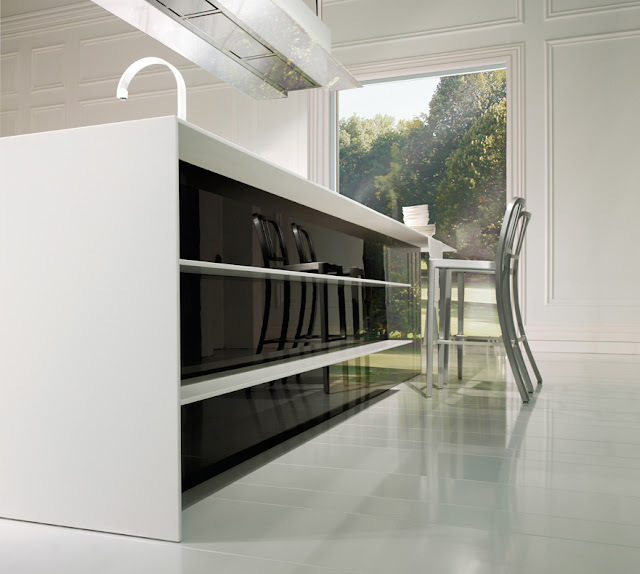 The creation of a cabinetry gap and a subtle shadow line between the underside of the cabinetry and the plinth makes it appear as though the units are free floating, somehow suspended from the worktop above. But consider what this powerful aesthetic focus has done to the functionality of the design. 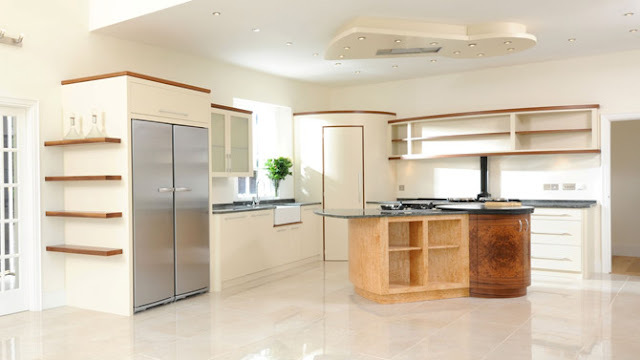 Despite the size of the kitchen both the cleaning and cooking areas appear to be compressed together in an uncomfortable functional arrangement. Options have been limited by the inclusion of the cabinetry gap and even if the hob was placed into the free floating section, conflict would soon arise between the wall units and the extraction system. Perfect equilibrium can be difficult to achieve! 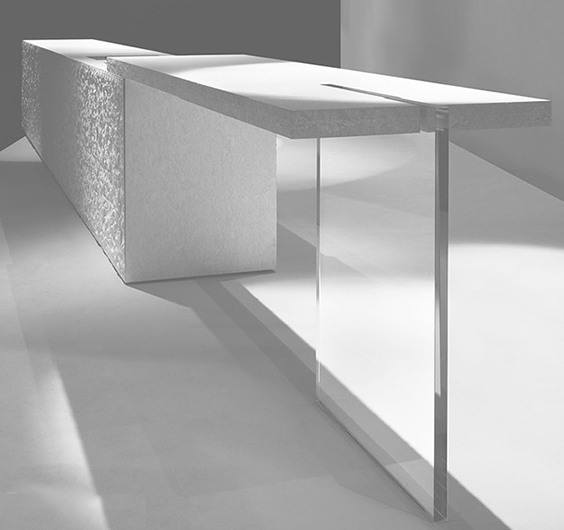 Only light is allowed to influence the purity of this design. The subtle contradiction between linear form and textured finish creates an interesting proposition for any architectural space. The split level cantilever with unobtrusive supporting element gives the design an edgy feel and allowing this feature to penetrate through the surface material is a real master stroke! The Mogul likes this one! It is said that opposites attract and here we see how contemporary kitchen design can become timelessly elegant though the sympathetic use of classically styled architecture. 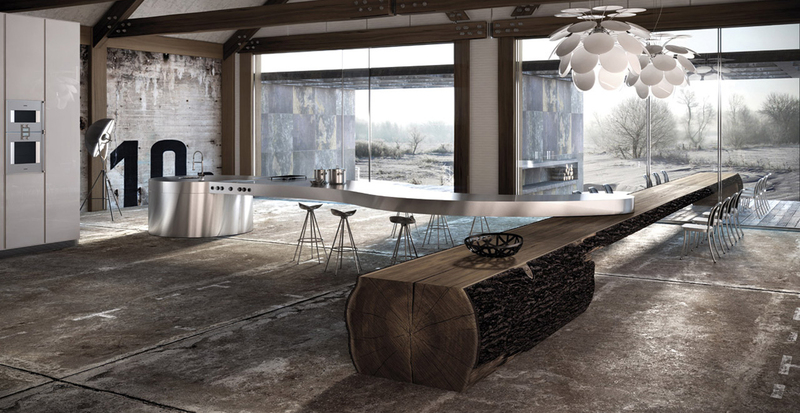 The quiet respect is mutual with both architecture and kitchen benefiting from the relationship. 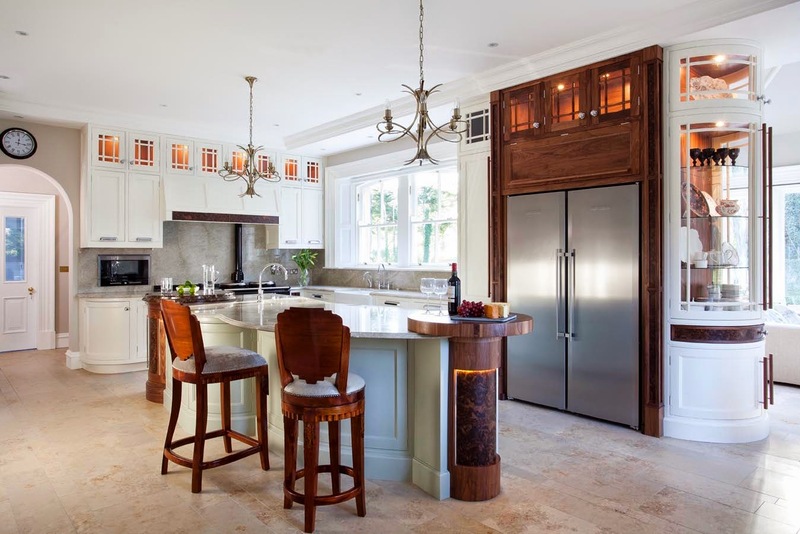 The kitchen brings a fresh, youthful energy to the space, delivering the required amount of functional and sensory impact expected of any new kitchen. 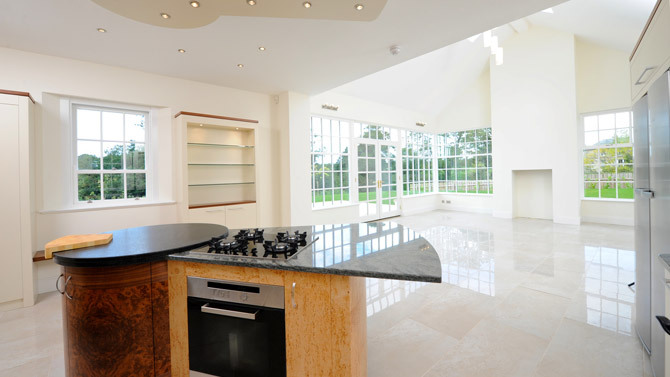 The architecture keeps the kitchen upstart in check, keeping the atmosphere grounded and bringing a tried and tested safety to the design. This type of relationship is blossoming but cannot be reversed as traditional kitchens do not work well with contemporary architecture! Or maybe we just haven’t seen it done properly yet! ?